Artist’s illustration of a lander on the surface of Jupiter’s ocean-harboring moon Europa. The budget request, which was released Monday (Feb. 12), allocates $19.9 billion to NASA in 2019 and lays out some details about the agency's plan to return humans to the moon — a key focus that the Trump administration announced this past December. Still, NASA has every intention of seeing that lander fly, based on NASA Acting Administrator Robert Lightfoot's remarks. During his State of NASA address at the agency's Marshall Space Flight Center in Alabama on Monday, Lightfoot took a rhetorical trip to 2030, imagining what NASA will have accomplished by then. Among the envisioned achievements: "We will have explored Europa and be well on our way to landing a probe there and possibly found biological evidence of life elsewhere in our universe." 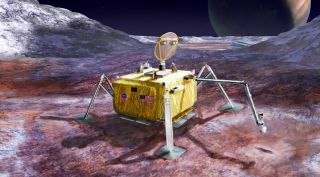 In late 2015, Congress directed NASA to study the possibility of adding a lander to the Clipper mission (whose chief task involves investigating the life-supporting potential of Europa's buried ocean). The agency has now determined that the best route involves launching the lander separately. The 2019 federal budget request is just a proposal; budgets must be approved by Congress to be enacted. So things could, and very well might, change.